Founded in 1900, Lee Brothers Storage & Van Co. was initially located at 210 E. 125th St. near 3rd Ave. Lee Brothers was also a furniture business and had auction rooms in their facility. In 1913 they moved to expanded quarters at 101-103 E. 125th St. on the northeast corner of Park Ave. As described in the New York Times, 16 April 1913, pg. 14, "[Leased] to Lee Brothers Storage and Van Company the northeast corner of 125th Street and Park Avenue, a twelve story fireproof storage warehouse, store and office building on plot 90x99.10 feet. The lease is for a term of twenty-one years ... Extensive interior improvements are to be made... The entire storage warehouse part of the building containing about 100,000 square feet, will be occupied by the Lee Brothers, in conjunction with their storage, van and furniture business, now at No. 210 East 125th street." 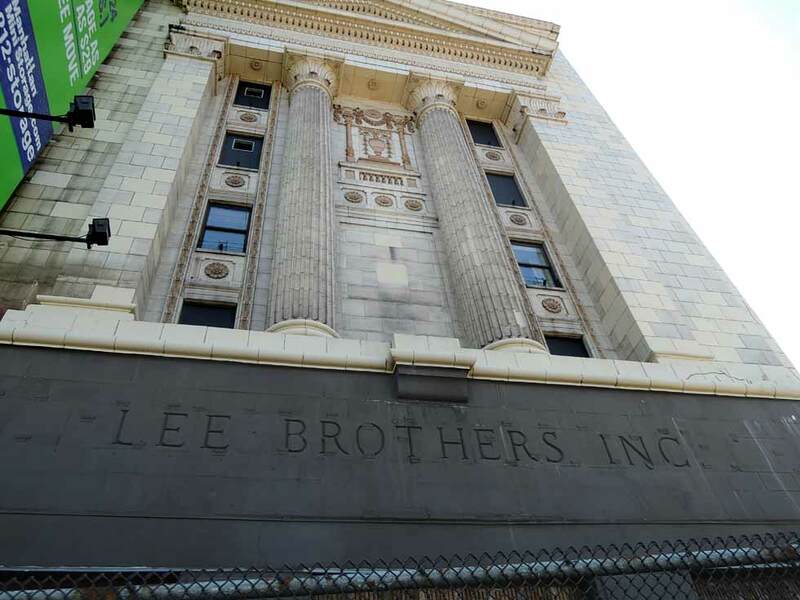 For several years the Lee Bros. continued to occupy both 210 E. 125th St. and 103 E. 125th St. They also added a warehouse at Tremont Ave. at Park Ave. in the Bronx (approx. 1920) and another at 521 Bergen Ave. the Bronx (approx. 1922). Also in 1922 they bought from the Washington Warehouse and Storage Co. a warehouse at 2298-2300 8th Ave. near 124th St. This was the same year they purchased the building at 125th St. and Park Ave. (New York Times, 15 March 1922, pg. 37). "The most interesting transaction in a great many years in Harlem has just been closed. It involves the sale of the Lee Building on the northeast corner of Park Avenue and 125th Street. This is a twelve-story fireproof office and warehouse building on plot 90 by 100. ... The Lee Building was originally owned by the Pittsburgh Life Insurance Company who, in 1913, leased it for twenty-one years to Lee Brothers Storage and Warehouse Company, a young and growing concern. On the failure of the Pittsburgh Life Insurance Company, this property, among other assets, was taken over by the Metropolitan Life Insurance Company, who, in 1922, sold to Lee Brothers. Originally the building was almost entirely used for furniture storage, but gradually Lee Brothers have converted about a third into offices, with retail stores on the ground floor. ..." (NYT 3 May 1925, pg. RE17). "A syndicate represented by Robert B. Bowler bought from Lee Brothers the twelve-story structure at the northeast corner of 125th Street and Park Avenue, opposite the Harlem station of the New York Central. ... The sellers are furniture dealers, who occupy the lower section of the building. They purchased the property in March, 1922... It was built by the Hamilton Storage Company and was later converted into offices." (NYT 9 August 1925, pg. 40). It was also in 1925 that Lee Bros. bought the property at Riverside Drive and 134th St. in order to build their own purpose built facility. As described in the Times, 22 Nov. 1925, pg. E16, "The Guardian Storage and Transfer Company, which is controlled by Lee Brothers, Inc., purchased from the Hensle Construction Company plot of ground 49 by 200 feet, situated on the northeast corner of Twelfth Avenue and 134th Street. Upon this plot Lee Brothers, Inc., propose to erect a fifteen-story fireproof warehouse which will contain every modern facility for the storage and packing of household effects. This building will have entrance from the lower level of Twelfth Avenue and 134th Street as well as from upper level of the 134th Street approach to the Riverside Drive viaduct." Plans were filed with the New York City Dept. of Buildings in 1925 for a 14-story warehouse, costing $250,000, at 647-666 W. 134th St. These plans, however, were revised two years later by a new filing for a 14-story storage building, costing $400,000, at 647-661 W. 134th St. In both plans the architect was George S. Kingsley. A listing for the new Lee Bros. warehouse first appeared in the Manhattan telephone directory in 1929. The last Lee Bros. listing for this address was in 1948. The following appeared as an F.Y.I. article by Daniel B. Schneider in the New York Times, 11 October 1998, "The beautifully detailed, classically inspired building, erected in 1929, was designed as a furniture warehouse and has remained just that. ... The warehouse was originally built and owned by Lee Brothers, whose name is still visible beneath layers of paint on the Riverside Drive facade. It was designed by George S. Kingsley, the architect who designed several other historically inspired storage warehouses in Manhattan and in the Midwest, according to Christopher Gray, the architectural historian. Viewed from without, the Lee Brothers warehouse is so splended that for years it has been rumored that it was built for the Astor family, said Neal W. Eisenstein, a vice-president for Manhattan Mini Storage, which has owned the building since 1984. The columns and pilasters mask a cavernous interior, containing over 1000 storage rooms and vaults, built of thick concrete and steel and dispersed over 14 floors. Roughly half the floors are built below street level, far below the viaduct, and the current entrance and loading dock are tucked into the West 134th Street side of the building." The founder of Lee Bros. was Charles Lee (1853-1953). He died at age 99 shortly before reaching his 100th birthday. There were obituary notices for Charles Lee in the New York Times, 18 June 1953, p. 32: "Charles Lee, who founded Lee Brothers Storage, Inc., 103 East Twenty-fifth [sic] Street, in 1900, died Tuesday in Orlando, Fla., where he had retired since his retirement in 1925. He would have been 100 years old next October 26. Mr. Lee, who is believed to have been the oldest member of the Odd Fellows, also established the Lee Brothers Furniture Company of Bridgeport and Derby, Conn." and the New York Herald Tribune, 18 June 1953, p. 28: "Charles Lee, ninety-nine, founder of Lee Brothers Storage, Inc., 103 E. 125th St., New York, died here [Orlando, Fla.] yesterday. Mr. Lee, a native of Charlestown, Mass., founded the storage business in 1900. He retired several years ago and moved to Orlando. A funeral service will be held at the Henry E. Bishop & Son, Bridgeport, Conn., at 3:30 p.m. Friday." The original business also included two brothers of Charles Lee, Henry Lee and John H. Lee. The brothers, however, are mentioned in directory lists only through 1909. More important to Lee Bros. were the Milligan brothers, George Henry Milligan (1881-1968) and Ernest Harry Milligan (1883-1968). George H. Milligam was secretary at Lee Bros. Storage & Van Co. in 1915. Ernest H. Milligan was treasurer at Lee Bros. Storage & Van Co. in 1909. His obituary in the New York Times, 3 October 1971, pg. 82, read, "Ernest H. Milligan, president of Lee Brothers, Inc., a New York storage company, and a founder of Allied Van Lines, a moving concern, died here [Fairfield, Conn.] yesterday. He was 88 years old and lived at 277 Greenfield Hill Road. Surviving are his widow, the former Mary Beers; a son, Roswell B. of Westport; two grandchildren, and two great-grandchildren." This ad for Lee Brothers Inc. appeared in the New York Central Railroad's Industrial Directory and Shippers' Guide, 1921, when the main office was 212 East 125th Street. This ad for Lee Brothers Storage appeared in Women's Wear Daily, November, 1928, when their address was 101 East 125th Street. This ad for Lee Brothers Inc. appeared in Women's Wear Daily, October, 1929, when their new facility was available at Riverside Drive and 134th St. This ad for Lee Brothers Inc. appeared in The Christian Science Monitor, 1932, and showed the columned facade at Riverside Drive and 134th St. This image, dated 1920, on the New York Public Library's Digital Collections shows a Lee Bros sign on their building at 125th St. and Park Ave. This later image, dated 1934, on the NYPL's Digital Collections shows a veritcal Lee Bros sign on the same 125th St. building seen from the opposite direction.